While rearranging my sewing room I came across several hand towels and bandannas that I had tucked away in my Operation Christmas Child craft pile a year or so ago. 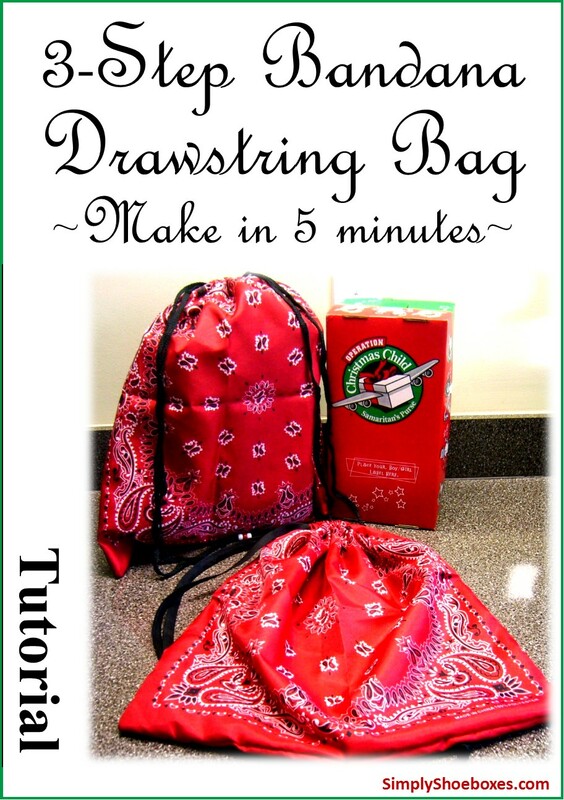 I decided to quickly turn them into drawstring bags and the 3-Step, Five Minute Drawstring Tote Bag was born! I love the sturdy fabrics and the fact that the seams are already finished. The terrycloth is also great for the hygiene items and one towel is the perfect size to hold them all. Shoe laces make good drawstrings. Wrong sides together pin from right below casing down to corners and across bottom. NOTE: you can put right sides together, stitch & turn. I liked the finished edges on the outside and the drawstring is easier to thread, but I did them both ways before I decided on this as my preferred. I do prefer right sides together for the bandannas. 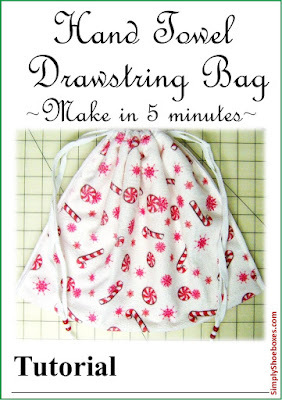 Feed one drawstring thru one side and then down the other side--using a large safety pin or tool made for this. Optional: before tying ends together slip pony beads on. Tie ends and pull beads close to knot. Wrong sides together pin from right below casing down to corners. Hand towels can often be found on clearance at the end of different seasons. I think we paid a quarter or less for each of these Christmas ones. We bought shoe strings at Dollar Tree -- 8 for a dollar. Notice that the design will be inverted. The designs on hand towels are made to be right side up when hung on a towel bar. I found that using heavy hand towels would take up too much room in the shoe box if making a full size bag -- they would be perfect for personal use as a beach bag or pool bag. Thin hand towels made into the full size seem fine for tucking in a shoe box. And you can check out the drawstring bag tutorials and inspiration found at Threading My Way's ongoing linky. 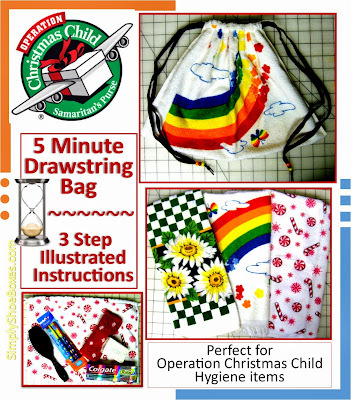 Have you crafted for your Operation Christmas Child shoeboxes with unusual items? Do you include tote bags in your boxes? I love the idea of turning them into back packs. I often crochet drawstrings. Adding the simple loops of ribbon would be quick and easy. Thanks for the tip. Great idea to use towels and bandanas, Cheryl. As always, an easy to follow tutorial. I have stacks of napkins from tablecloth 'sets', most never used. 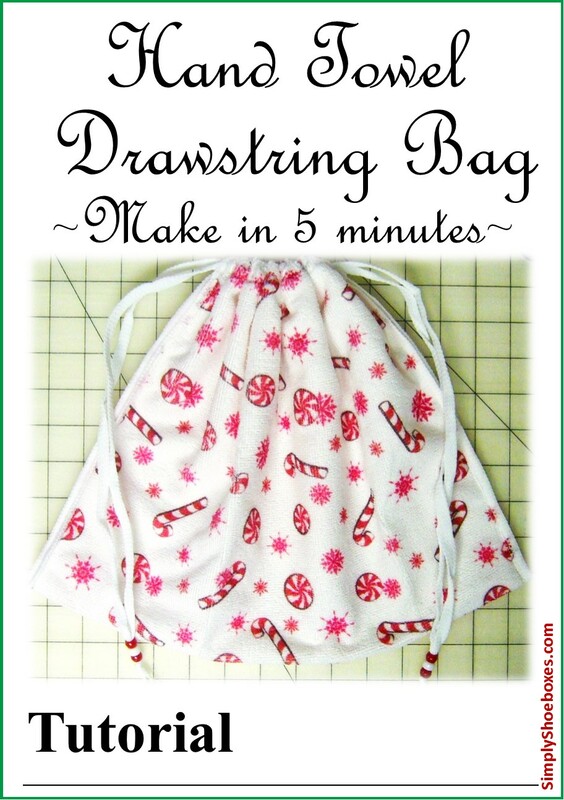 They make quick and easy bags, and that drawer full of napkins becomes pretty bags for OCC boxes. That is a project for 2016 boxes, need to start early, did not get many made this year. These bags are wonderful ideas, especially the ones made into backpacks. I have volunteered at the distribution center in Charlotte, NC for several years and wouldn't exchange the experience for anything. Processing the boxes is a 3 stage process, each stage requiring that the boxes be opened for inspection to make sure the contents are appropriate, sufficient, or that unacceptable items or money are removed and additional allowed items added. So, my advice would be to make the bags to be placed inside the boxes rather than the boxes in the bag. At any given moment there are hundreds of boxes being passed down the line, and time is of the essence. Having to remove the boxes and then reinsert them into the bag would be unworkable. Also, the boxes are packed into tight fitting cartons that hold only a specified number perfectly. Bags on the outside would end up being cast aside to allow for perfect fit. Again, the bags are a wonderful idea. I may try to make a few myself. But, I will place them inside my 2016 boxes. Just wanted to give you my perspective. Alice~Absolutely!!! Thanks for sharing! We do always pack them INSIDE the boxes! The only reason one box is pictured in the bag, instead of the bag inside the box is to show what size it is/that the child could, after distribution could carry the whole box in the bag. As the post said, thick towels aren't as good because they take up too much room in the boxes. Rather than purchasing shoe strings, cords, etc. I've resorted to cutting a 1-1 and half inch strip off bottom of tee shirts just above hem, then stretching it as tightly as possible to make a cord. Saw the idea from another making jump ropes for OCC boxes. Great idea. My daugter loves to sew and this would be a great easy project for her to do for OCC. We also use old t-shirts to make drawstring bags and run our shoelace through the hem at the bottom. I love these ideas, too!